A couple of weeks ago, on March 26th, former airline pilot Michel Bacos died in France at the age of 94. Although Bacos had been retired for many years, his extraordinary courage in the summer of 1976 was fondly remembered across the world after his passing. Bacos shot to fame when he refused to abandon his Jewish passengers after a gang of Palestinian and German terrorists hijacked Air France Flight 139 on its way from Israel to Paris via Athens. 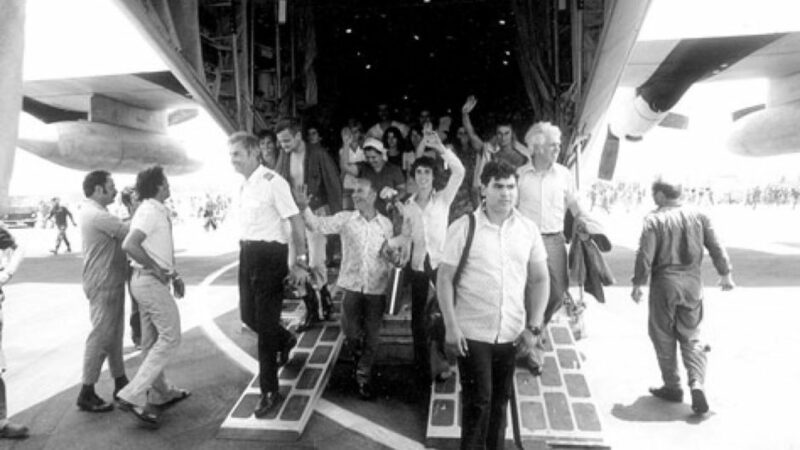 The plane was diverted to Libya, and then Entebbe, Uganda, where non-Jewish passengers were released, while Jewish passengers were locked up under armed guard in the transit hall of an abandoned former terminal building. Offered the chance to join hostages who were being freed, Bacos refused to leave his passengers behind, and convinced his crew to do the same. In real time this seemed like a suicidal decision, particularly as the PFLP and Revolutionäre Zellen terrorists were known for their utter ruthlessness, added to which Israel had an established policy of never negotiating with terrorists. Riots broke out outside Prime Minister Yitzhak Rabin’s compound in Jerusalem, as it dawned on the families of hostages that a negotiated solution was not on the cards, and the deadline after which their relatives would be butchered was drawing ever closer. What both the families and Bacos did not know was that Israel was about to embark on one of the most audacious rescue missions in history—a mission that would result in the death of all the hijackers, and the dramatic rescue of almost all the hostages, with just a handful of casualties. Tragically, the fatalities included Yoni Netanyahu, commanding officer of the elite commandos who carried out the mission. 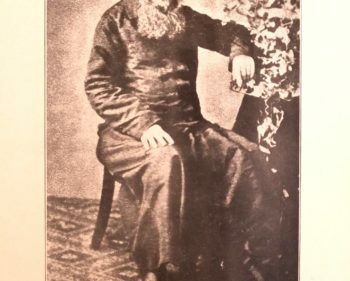 His brother Benjamin would later become Prime Minister of Israel, and has just been reelected for a record-breaking fifth term. Sara Guter Davidson was one of the more than 100 Jewish hostages held captive in Entebbe that fateful week. Caught up in the nightmare together with her husband Uzi and their two teenage sons, she kept a diary throughout the ordeal. 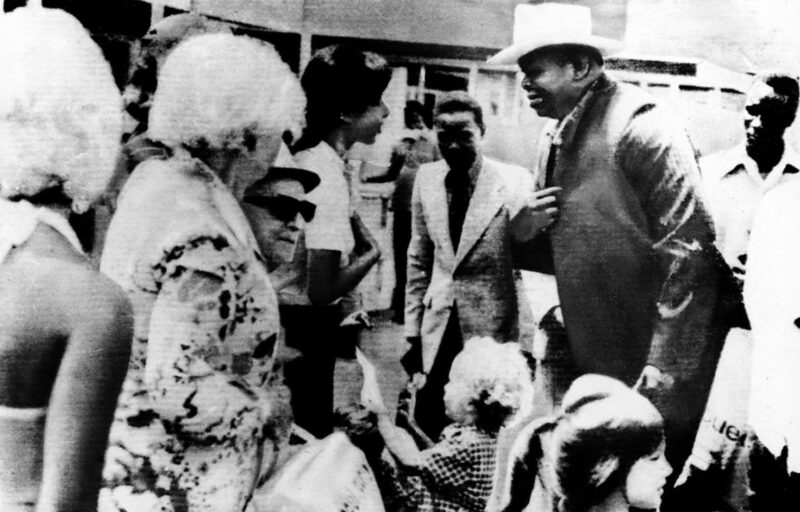 Ugandan dictator Idi Amin Dada visits Jewish hijack hostages in Entebbe Airport, July 1976. As the days unfolded and tension increased, her sense of looming death increased. On July 3rd 1976, exactly one week after the hijackers had forcibly taken control of the plane, Davidson went to sleep knowing that the first hostage executions were scheduled to begin the following day. An hour later she awoke to the sound of gunfire, and immediately feared the worst. She spread herself out over her 13-year-old son to protect him from bullets, and prayed that it would all be over quickly. But a moment later Davidson heard Hebrew and looked up to see Israeli commandos ushering them to safety. Bullets whizzed past them as they shuffled out of the terminal towards a waiting Hercules aircraft that had appeared out of nowhere to whisk them away to safety. It was a miraculous moment, one that she and her fellow hostages never dreamed would happen. Although Davidson has never been back to Entebbe, this February, for the first time since 1976, an Israeli plane carrying tourists landed at Uganda’s Entebbe Airport. 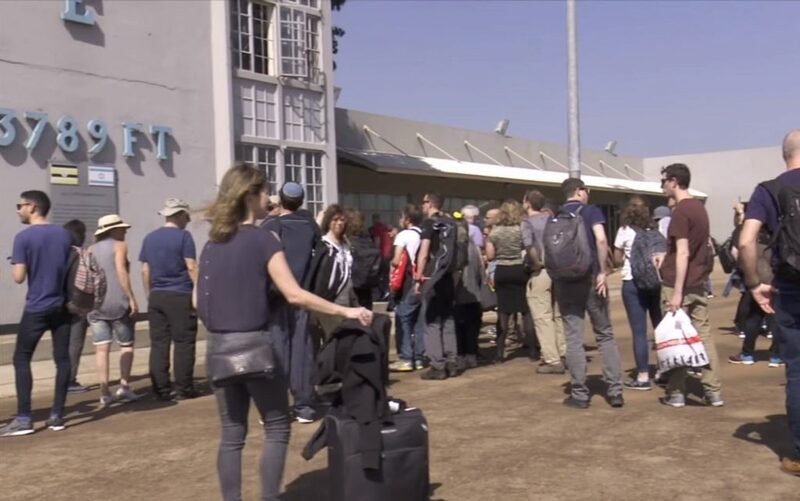 Over 250 Israelis arrived for the three-day trip, and the first place they visited was the site of the terminal building where the Jewish hostages were held and later rescued. Itzik Gerber, the Israeli pilot who flew the Israeli group to Uganda, was very taken by the moment. Three years ago, Prime Minister Netanyahu visited Entebbe for the fortieth anniversary of the ambitious operation. Yoni’s death was a pivotal moment in his brother’s life, forcing him to reconsider his chosen career path in business, and spurring him on to focus on a career for Israel. Coming full-circle is not a chance afforded to everyone, and many people who go through harrowing experiences understandably shy away from reliving those moments in the places they occurred. But just as a phoenix rises from the ashes, the greatest incubator for positive growth is somehow reliving the very experience that once threatened to destroy you. On Passover we are subjected to a strange directive: relive the Exodus, be a slave in Egypt, eat the bread of affliction, dip bitter herbs into a cement-like mixture to remind you of the years of bitter slavery when your ancestors were forced to construct edifices for their Egyptian overlords. At the same time, we are expected to drink four cups of wine to celebrate our freedom, and to eat the feast of a lifetime to commemorate our salvation in the face of destruction. This instruction, recorded in the Passover Haggadah, is not simply an exercise in experiential education. It is a mandated process of coming full-circle, so that we can truly maximize the formative experience represented by the Exodus. You can talk about it all you want, but unless it is personally experienced, and regularly reinforced by revisiting that moment in as vivid a way as possible, the value of this seminal formative moment will be lost over time, and certainly over generations. Jewish tradition does not demand we visit Egypt annually to benefit from this phenomenon; rather we are expected to recreate ancient Egypt in our homes each year to ensure that the full-circle experience continues to impact our Jewish identity, and reinforces the powerful relationship we have with God that began in Egypt. What is so incredible is that this process has really worked. Each one of us is living testament to its success.